If your colouring is light go for a baby pink that won’t overpower you. 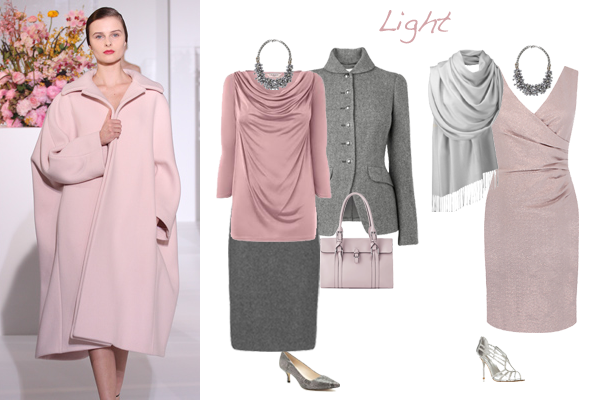 Mix with light grey and silver for business and evening. With deep colouring the richer berry colours will be good for you. Mix with black, chocolate brown, a deep pine green or as shown on the catwalk, cobalt blue. True pink isn’t good for you so steer towards more peachy or coral pinks and keep the look warm with tan, cream, camel and brown. As a cool, pink is great on you - go for fucshia, baby pink, hot pink and burgundy. Wear with contrast like light grey or cream or mix with navy or charcoal for business. The clear shades of pink will look fantastic on you. Make sure you mix with other jewel colours or with a light contrast. As someone who can wear black bring it to life with hot pink. Despite your soft colouring you can wear pinks that have strength. Use them to give your neutrals a bit of zing and always wear with lipstick.